Our Health Ring (*) is an innovative esoteric product for health and acoustic applications. Its highly structured molecular composition neutralizes negative disturbances. 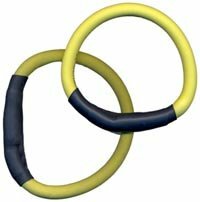 Carbon ring that can be used as a wrist bracelet for health reasons: it helps victims of whiplash (instability of the neck and spine after a strong impact, e. g. car accident). Improves the physical condition and reduces stress. It also works as a room acoustic conditioner helping to minimize soundstage problems. The rings are to be positioned at specific places in the room and on the equipment itself. Results are almost immediately audible. (*) Hand made by A. J. van den Hul to each customer specific wrist size measurement. Its diameter fits perfectly when it slides in through your hand slightly squeezed. It beneficial effects start after a few days wearing it day and night. “These rings go a long way helping patients recovering from whiplash injuries. More specifically its psychological consequences in the form of mental block. An article on the uses and applications of the Health Ring will be issued a. s. a. p.
Our Health Ring (*) is an innovative esoteric product for health and acoustic applications.